All items are for sale! Call or email us today for pricing. This 8'x8' shed is perfect for your backyard gardening needs. We designed it in a modular system so it can be easily taken apart and reassembled on site. Call or email for more details! Our picnic tables feature pressure treated wooden legs with seats and tops built with untreated pine that we seal in house. Built to last and ready for your next barbecue!. Below you can see photographs that document how the fence was built step by step . 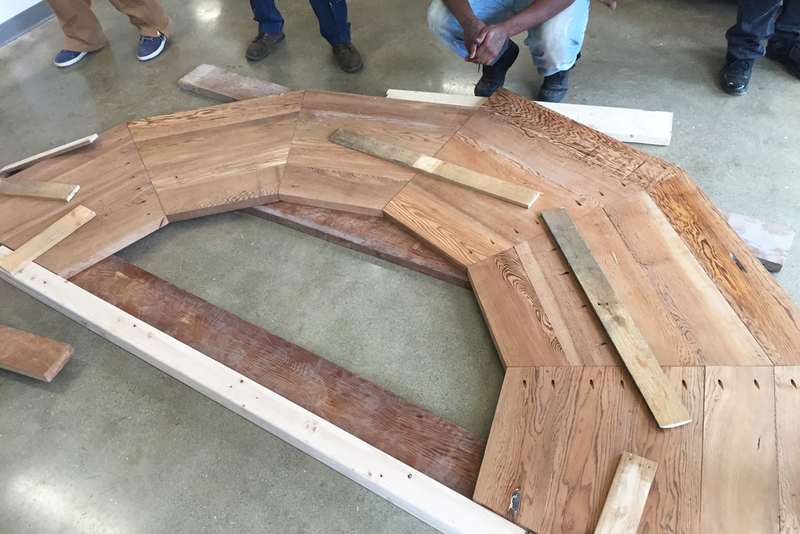 A team of Green Opportunities students was tasked with designing and building a custom desk for the entry of the Edington Center. The desk needed to blend in with the aesthetic of the newly renovated center (formerly known as the Reid Center) while still acknowledging the history of the building. Students began the design process with simple sketches that evolved into scale models and eventually the two-tiered, semi-circle shape. This allows ample work space but also creates a focused center for the entry of the building. The main building material was reclaimed spruce lumber from the Aston Towers renovation and glass blocks from the Reid Center. The final product was a beautiful, one-of-a-kind desk that tells a story in itself. It reflects not only the history of the building which means so much to the Southside community, but also illustrates the creativity and drive of the students striving to make positive changes in their lives. Below you can see photographs that document how the desk was built step by step . By marking out the exact dimensions we were able to make an accurate plan get a feel for the space. 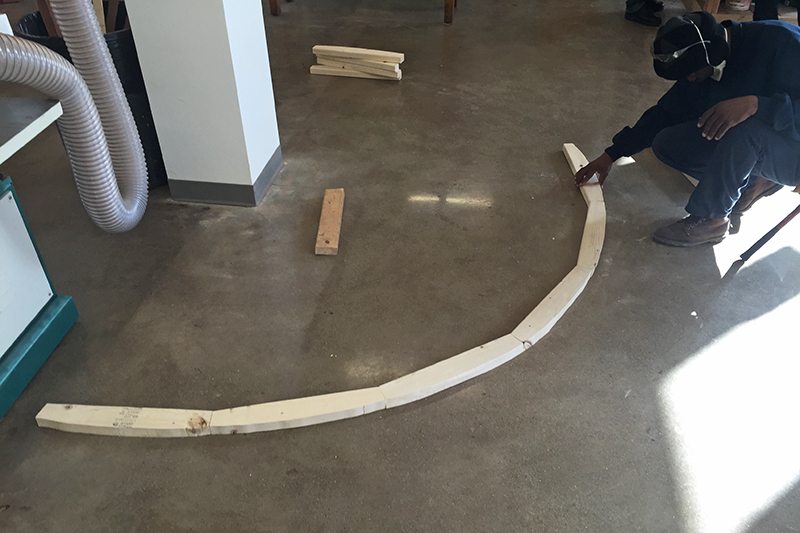 The frame was constructed by cutting curved sections of lumber on the bandsaw. Curved plates were cut and laid out to support the desk top. Next, we connected the bottom and top plates with vertical studs. The completed frame was set in place temporarily to make any changes before constructing the tops. The desktop was constructed of 2 inch spruce salvaged from the Aston Towers renovation. Lengths of lumber were glued together to create wedges which would make up the circular top. This is the assembled top before cutting the curves. We created a custom jig for the router to get just the right radius. This is the top with the inside radius cut. After cutting both radii for the top, we attached the finished top to the frame. The desk was built in two halves in order to be transported to its final installation site. More reclaimed spruce was used to face the vertical parts of the desk. Here is the desk shown after attaching the top. The next step was to build the upper tier. We used glass blocks salvaged from the Reid Center renovation in order to tie the history of the building to the new desk. After a lot of sanding, we applied several coats of a whey-based polyurethane to the desk. We prefer to use environmentally-sound products such as this whenever possible. This is the completed desk and the proud crew who built it! Students designed and built this beautiful server station for the Southside Kitchen, a donation-based restaurant located in the Edington Center. It was built using recycled spruce from Aston Towers, the same material used to build the dining tables in the cafe. Below you can see photographs that document how the server station was built step by step . We created biscuit joints in the 1x spruce we chose to build the sides of the cabinet and bookshelf. We glued and biscuit-jointed several 1x boards to create the sides of our cabinet and shelf. 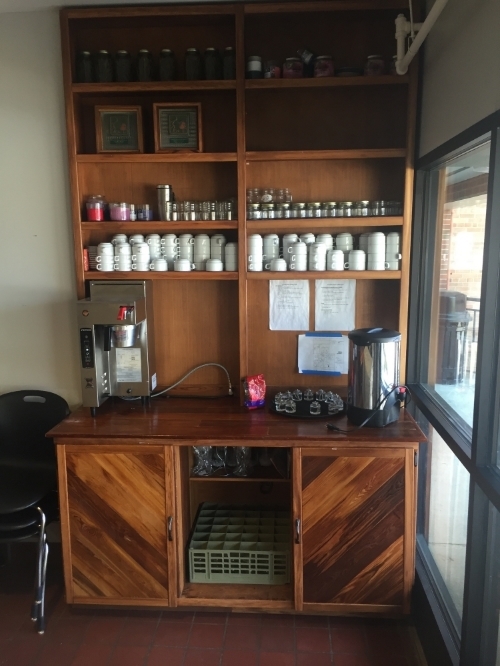 The shelves were installed into dados in order to create a strong rigid cabinet. Here is the fully assembled lower cabinet with the top installed. We decided on creating doors with floating panels fit inside a dadoed frame. We built the doors using the chevron design of the dining tables in the kitchen to create a sense of unity in the space. We built the upper shelves as a separate unit in order to be able to move it to install. This is a picture of the assembled bookshelf before finishing. The top and panels of the doors were finished first with teak oil before polyurethane was applied. The final unit fit perfectly into its permanent space. A great project completed by an awesome group of students.